Patients at a high risk for a second stroke who received intensive medical treatment had fewer strokes and deaths than patients who received a brain stent in addition to the medical treatment, a large nationwide clinical trial has shown. The investigators published the results in the online first edition of the New England Journal of Medicine . The National Institute of Neurological Disorders and Stroke (NINDS), part of the National Institutes of Health, funded the trial. The medical regimen included daily blood-thinning medications and aggressive control of blood pressure and cholesterol. New enrollment in the study was stopped in April because early data showed significantly more strokes and deaths occurred among the stented patients at the 30-day mark compared to the group who received the medical management alone. In addition to the intensive medical program, half of the patients in the study received an intervention of a self-expanding stent that widens a major artery in the brain and facilitates blood flow. One possible explanation for the higher stroke rate in the stented group is that patients who have had recent stroke symptoms sometimes have unstable plaque in their arteries which the stent could have dislodged, the study authors suggest. The study device, the Gateway-Wingspan intracranial angioplasty and stenting system, is the only system currently approved by the U.S. Food and Drug Administration (FDA) for certain high-risk stroke patients. 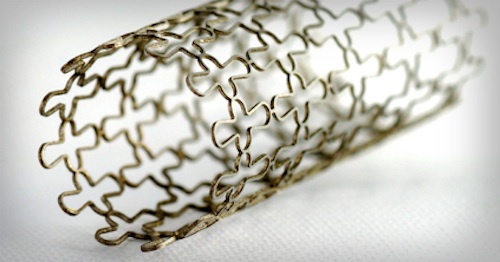 The authors noted that although similar stenting systems that do not have FDA approval are being used in clinical practice, they did not evaluate those devices in this study. The authors also emphasize that the study participants were in the highest risk category, with blockage or narrowing of arteries of 70 to 99 percent. Stroke patients with moderate cerebral arterial blockage (50-69 percent) were excluded because their risk of stroke is low with usual medical management, and researchers thought this group would be unlikely to benefit from stenting. This study provides an answer to a longstanding question by physicians — what to do to prevent a devastating second stroke in a high risk population. Although technological advances have brought intracranial stenting into practice, we have now learned that, when tested in a large group, this particular device did not lead to a better health outcome. Stroke is the fourth leading cause of death in the United States. Stenosis, a blockage or narrowing of brain arteries caused by the build-up of plaque, accounts for more than 50,000 of the 795,000 strokes that occur annually nationwide. Stenosis is particularly common in African-Americans, Hispanics, Asian Americans and people with diabetes. The NIH Stenting vs. Aggressive Medical Management for Preventing Recurrent Stroke in Intracranial Stenosis (SAMMPRIS) study enrolled 451 patients at 50 sites across the United States. The investigators looked at whether patients had a second stroke or died within 30 days of enrollment, or had a stroke in the same area of the brain from 30 days to the end of follow-up. They had hypothesized that compared to intensive medical therapy alone, the addition of an intracranial stenting system would decrease the risk of a stroke or death by 35 percent over two years. Instead they found that 14.7 percent of patients (33) in the stenting group experienced a stroke or died within the first 30 days after enrollment, compared with 5.8 percent (13) of patients treated with medical therapy alone. There were five stroke-related deaths within 30 days, all in the stenting group, and one non-stroke-related death in the medical management group. During a follow-up period of just less than one year, 20.5 percent of patients in the stenting group and 11.5 percent of patients in the medical group had a stroke or death, or a stroke in the same area of the brain beyond 30 days, a highly significant difference in favor of the patients in the study’s medical group. Based on these data, the Data and Safety Monitoring Board recommended that the NINDS stop new enrollment, and the NIH issued a clinical alert. All patients will continue to be followed for two years to determine the long term effects of both interventions. SAMMPRIS is the first stroke prevention trial to compare intracranial stenting with medical therapy and to incorporate intensive medical management into the study design. This includes a daily dosage of 325 milligrams of aspirin; 75 milligrams a day of clopidogrel, a medication used to prevent blood clots, for 90 days after enrollment; and aggressive management of key stroke risk factors — high blood pressure and high levels of low density lipoprotein (LDL), the unhealthy form of cholesterol. All patients also participated in a lifestyle modification program which focused on quitting smoking, increasing exercise, and controlling diabetes and cholesterol. In a previous NIH trial, stroke patients with criteria similar to those enrolled in SAMMPRIS were treated with less intensive medical management. Their comparable 30-day and one year rates were 10.7 percent and 25 percent, respectively. The investigators note that comparisons with historical controls have limitations, but the much lower event rates in the medical group in SAMMPRIS suggest that the intensive medical management was effective in lowering the stroke risk. The SAMMPRIS study results have immediate implications for clinical practice. Stroke patients with recent symptoms and intracranial arterial blockage of 70 percent or greater should be treated with aggressive medical therapy alone that follows the regimen used in this trial as closely as possible. Patients in the study were between 30 and 80 years old and had experienced a recent transient ischemic attack, a type of stroke that resolves within 24 hours, or another type of non-disabling stroke, which was caused by a large degree of stenosis in a cerebral artery. Chimowitz et al. Stenting versus aggressive medical therapy for intracranial arterial stenosis. N Engl J Med. 2011 Sep 15;365(11):993-1003. Epub 2011 Sep 7.